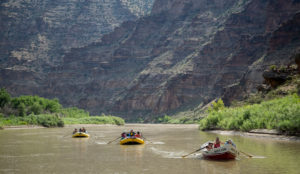 Rowing in the Rocky Mountains and greater Colorado is a mesmerizing experience. 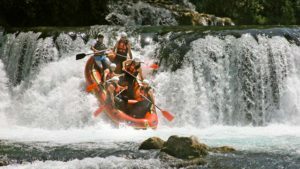 Depending on your chosen body of water, the scenery flying by could be anything from sheer cliffs and steep peaks to forested areas and sandy banks. This fast-paced, team-centric sport is a great way to appreciate everything natural the state has to offer. It’s so fun, in fact, you might forget it’s exercise. Rowing is a true total-body workout; it engages nearly every muscle from your shoulders to your calves. Both the upper and lower body are used in creating a full rowing stroke, providing a solid workout with little chance for rest. From the minute you start rowing, you must continue engaging your body or else risk a halt in movement. The rowing motion has several phases: The Catch, the Drive, and the Finish. Each phase of the movement engages a separate set of muscles. The Catch works your hamstrings, erector spinae, gastrochnemius, and soleus–your lower back and the backs of your legs. When you begin the drive, tension moves to your upper body, working the rhomboids and beginning to engage the quadriceps–your upper back and the front of your thighs. 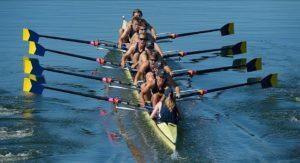 At full Drive, the rower engages nearly every part of the body–the trapezius, deltoids, rhomboids, triceps, pectoralis major, rectus abdominus, quadriceps, erector spinae, glues, hamstrings, gastrochnemius, and soleus. Even your wrist extensors and flexors are engaged. The Finish continues working all of these muscles but adds the internal and external obliques. Rowing takes you places–literally. The sport provides one of the best low-impact cardiovascular exercises around. Next time you decide to take a ride with your friends, club, or team, calculate the number of calories you burn–you might be surprised.